The death certificate originating from the oldest book of an 1829 return Protestant from a resource the national archives in Opole, which covers the period 1679-1747. This is the book of the metrykalna Evangelical Parish in Byczynie. The book was written in three languages: German, Polish and Latin. The transition between different languages is smooth, sometimes one Act was written in two languages. "6. 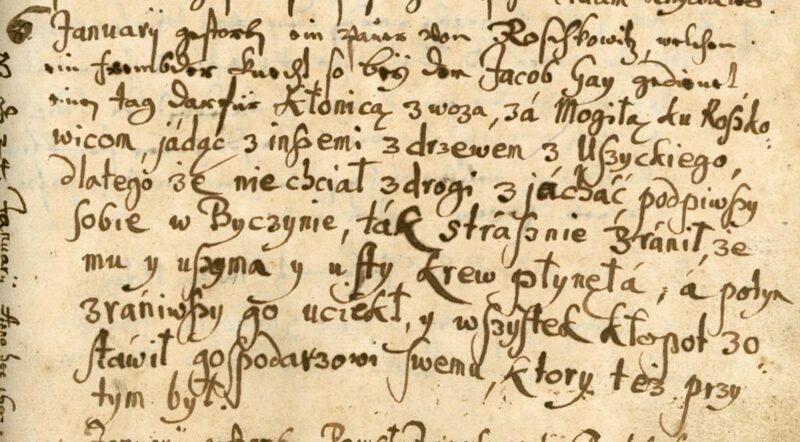 January  gestorb [en] ein Pauer von Roschkowitz, welchen ein fremsder Knecht so bey dem gedienet einen darfür tag, Gay Jacob Kłonicą of woza, connector Mogiłą ku Roszkowicom, jádąc with inszemi from a tree with the Uszyckiego, because he did not want the road zjácháć, podpiwszy in Byczynie, ták strásznie źránił y y uszyma him bold blood płynęłá, á potyn zrániwszy it ran away , y all the trouble zostáwił the host, who also was at the same time. " Photo and description comes from the national archives.